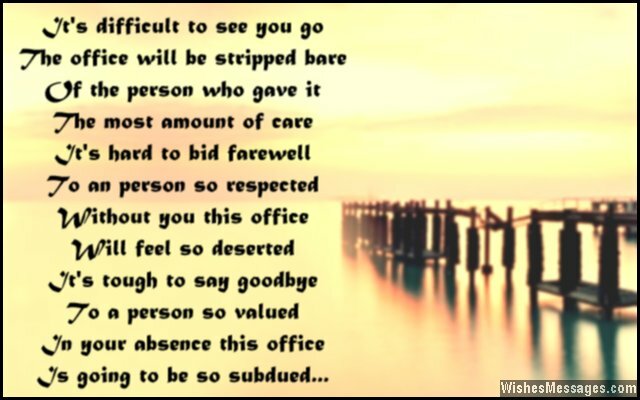 Farewell Poems for Colleagues: Say goodbye to your co-workers by writing a touching poem on a greeting card or in a letter. Use inspirational quotes along with the sweet and funny memories of working together to stir up a storm of emotions. Post your poem on your co-worker’s Facebook too. Whether your bestie at work is leaving for a new job or resigning due to retirement – show gratitude for the motivation, mentorship and guidance he or she has given you. People become colleagues out of compulsion but being friends outside work is a choice. So make sure that the words you choose to say goodbye are a fitting end to your professional relationship and the perfect beginning of a personal friendship. 10) To my dear colleague….